It seems as though FCA can’t get enough of creating different versions of the iconic SUV. After unveiling the Jeep Wrangler Red Rock Concept at the SEMA show, the brand will be presenting the 2016 Jeep Wrangler Backcountry at the Los Angeles Auto Show next week. But that’s not all. The 2016 Jeep Grand Cherokee SRT Night will also make its appearance. The new edition of the hot-rod SUV features a glossy black finish of the roof, the rear spoiler, the front grille as well as the B and C pillars. It also gets satin black front trim piece, badging and split five-spoke 20-inch alloy wheels. Inside, the SRT Night also offers Black Laguna leather upholstery with silver contrast stitching and black chrome instrument bezels. Three paint colours are available, including Velvet Red, Billet Silver and Granite Crystal. As for the 2016 Jeep Wrangler Backcountry, it’s based on the Sahara version, but boasts a winter theme with powder-coated bumpers, black 17-inch Rubicon alloy wheels and a black fuel filler door. It also comes with a black hardtop, while a body-colour hardtop is optional. The Backcountry’s cabin includes piano black vent rings, door handles and grab handles. The console lid and door panels also get vinyl wrappings with gray stitching, black leather and mesh-trimmed seats, a nine-speaker Alpine stereo and slush mats. Five paint colours are available, including the exclusive Xtreme Purple in addition to Hydro Blue, Bright White, Granite Crystal and Black. Both these special-edition models will be on sale in Canada. The Wrangler Backcountry will arrive at the end of November, while the Grand Cherokee SRT Night will hit showroom floors in the beginning of 2016. Jeep continues on a roll with record sales continuing into 2015 thanks in part to their largest ever model lineup, which now includes eight variants. The latest model in the Jeep inventory is also the smallest in the lineup, the 2015 Jeep Renegade, and we recently spent a week driving this newest model. The Renegade is just a few inches longer than the Mini Countryman and the Fiat 500L, and nearly the same length as the Jeep Wrangler. It’s the first vehicle to use Fiat Chrysler Automobiles’ new “small-wide 4×4 architecture.” What makes it especially noteworthy is that it’s not simply an all-wheel drive like many competitors, it’s a full-fledged, Trail Rated off roader, complete with a Selec-Terrain traction system that allows the driver to choose the best setting for on- or off-road. It even has an amazing 20:1 crawl ratio that feels powerful enough to climb trees if it could get the traction. It also comes with hill start assist and hill descent control. Statistically, we know most Jeep Renegade owners are probably going to be in the “I could (go off-road) if I wanted to” category, so it’s also designed to be very fun to drive on-road. The Renegade looks very Jeep-like with its rugged-looking trademark Jeep grille, round headlights and front fascia. The sides have the traditional Jeep trapezoidal wheel arches and body protecting contrasting color cladding. The sculpted rear end has the Renegade signature “X” pattern in the tail light lens. The “X” is the Renegades design theme inspired by military equipment –exuding strength and playing on Jeep brand’s roots. To help with the coolness factor, Renegade planners made it available in some standout colors. The interior is cozy, and quite comfortable but the dash looks a bit cluttered, although the controls are easy to reach and user-friendly with real knobs as opposed to overly sensitive touch controls. The seats in our entry-level Sport test vehicle look good and are comfortable finished with a two-texture cloth — upper level models are available with leather. Each of the trim levels has at least two color accents available, with the exception of the Trailhawk, which comes only in black with red highlights. The Renegade incorporates some of the Jeep Wrangler open air features with removable My Sky open-air roof panels. The optional power tilt/slide top and the manual panels can be easily removed and stowed in a convenient pouch in the cargo area. The cargo area holds up to 18.5 cubic feet of gear when the rear seats are in place, but that expands to 50.8 cubic feet when the rear seats are folded flat. Jeep did not skimp on technology; the Renegade has a segment first Forward Collision Warning-Plus and Lane Sense Departure Warning-Plus. It also has Blind Spot Monitoring and Rear Cross Path detection systems available. Jeep lists 70 safety and security features on the Renegade including cool features like automatic dimming headlights, front wiper deicers, remote start and Jeep’s outstanding Uconnect Access and Voice Command. The 2015 Jeep Renegade is available with two engine choices, a 1.4-liter MultiAir Turbo four-cylinder and a 2.4-liter Tigershark four-cylinder. The 1.4-liter turbo, which is standard in both front- and four-wheel drive Sport and Latitude models, produces 160-hp and drives through a standard six-speed manual transmission. A nine-speed automatic transmission is optional in those models and standard in the Limited and Trailhawk versions. The award-winning 180-hp Tigershark engine is standard on the upper-level Limited and Trailhawk trim levels and is an option on the other models. We have felt a bit of roughness on some other applications of the ZF nine-speed automatic transmission, but the Jeep version is smooth and refined plus it helps boost the fuel economy. The Sport, Latitude and Limited trims are available in front- and four-wheel drive, while the Trail Rated, Trailhawk model is only offered with the four-wheel drive. The 2.4-liter with automatic transmission and 4WD gets an EPA fuel economy rating of 21 mpg city, 29 mpg highway and 24 mpg combined. We actually averaged 23.6 mpg during the week we drove it. Renegade pricing starts at $18,890, including the destinations charge for a two-wheel drive Sport, then prices jump to $22,290 for the Latitude and $25,790 for the Limited. Four-wheel drive adds $2,000 to these prices. The off-road Trailhawk model is $26,990, and with exuberant option additions could take the price to just over $33,000. Barbara drove the Renegade under a variety of challenging off-road conditions at the famous Hollister Hills off-road park when she attended the national introduction in last January and found it to be the real thing. We’re not sure how it would fare on tests like the infamous Rubicon Trail, but short of that, it’s very much a Jeep. At home the 2015 Jeep Renegade is impressive. It’s equally impressive on-road, too. The ride is quiet, and more comfortable. The steering is precise and there is no significant body roll when cornering. We think the Renegade will contribute to further Jeep sales growth. When Ram brought their venerable Power Wagon back to the Ram 2500 heavy duty lineup in 2014, Ram 1500 loyalists immediately began calling for a unique off-road featured truck in the full-size segment too. As it turned out, they did not have to wait very long as – unknown to them at the time – the Ram 1500 Rebel was on the way. However, since its arrival early in the second half of 2015, Ram dealers have not been able to get enough of these unique off-road design crew cabs Rebels to meet the demand. Taking design and engineering cues from the heavy duty Ram 2500 Power Wagon and incorporating them with popular elements of the full-size Ram 1500 Crew Cab, Ram designers created a unique style and performance identity for the Ram Rebel. A full-size pickup that is very capable off-road, but also a great daily drive truck as well. We have driven the Ram 1500 Rebel a number of times since early this year, most recently at the Texas Auto Writers Association Truck of Texas competition in October where it was named the 2015 Full-size Pickup Truck of Texas. Needless to say, its blend of Power Wagon off-road prowess with traditional Ram 1500 capability and civility not only impressed us, but also a majority our automotive media group as well. In the last month, Ram was able to spring a 2015 Ram 1500 Rebel from the factory to our driveway for a week-long ride and drive test. Now, after a full week wheeling one around the Hill Country of Central Texas, we can absolutely confirm that Power Wagon off-road prowess coupled with the full-size road civility of a Ram 1500 – uniquely packaged as Rebel – is solidly answering that earlier call. The new Ram 1500 Rebel comes only in a Crew Cab with a 5-ft. 7-inch bed and is powered by the 3.6L PentastarV6 engine or the optional 5.7L Hemi V8. A specific engine-tuned 8-speed automatic transmission is integrated to each. Rebel is available in with either a 4×2 or 4×4 configuration with an On-Demand or Part-Time Transfer Case. A first look reveals that the Ram 1500 Rebel runs boldly on off-road beefy 33-inch (LT285/70R17E) Toyo Open Country A/T all-terrain tires mounted to all-new 17-inch one-piece aluminum wheels with matte black painted accent pockets and multi-angled surfaces. Ram Rebel sports a unique grille with a billet silver ‘RAM’ letter badge on a blacked-out Rebel grille that tops a new black off-road front bumper. Integrated to the bumper is a billet silver skid plate, with new front tow hooks and new LED fog lamps. Black bezel bi-functional projector headlamps with LED marker lights rest beneath an aluminum, twin-snorkel sport hood to complete the distinctive look at the front. Rebel’s blacked-out styling continues along the side with black Power Wagon wheel-arch moldings, flat-black badge, mirrors and lower body panels. A new two-tone paint scheme with black as a constant on the lower body is available from front to rear. At the rear, a bold new ‘RAM’ stamped tailgate with blacked-out lettering with a ‘Rebel’ and ‘4X4’ badges identify Rebel from the rear. The rear bumper features a durable black powder coating and flared cutouts around dual chrome-tipped exhausts finishing and tail lamps with black bezels to match the front lighting. The interior of Rebel has all of the amenities and features of a well-equipped Ram 1500 – flavored with a unique Rebel identity starting with bucket seating covered in high-durability technical grain vinyl and finished in Radar Red and Black with Sedoso fabric inserts embossed with the Toyo tire tread pattern. Front seats are heated and feature Light Diesel Gray accent stitching, with Radar Red Ram’s head embroidery on the headrests and Black with Light Diesel Gray Rebel nameplate embroidered on upper seat bolsters. The two-tone Radar Red and Light Gray accent stitching continues on the all-black instrument panel, door armrests and logo-embossed center console armrest cover, The center stack and console are finished in Iron Gray Metallic paint giving a cast-iron appearance. A newly designed center console bin incorporates a cellular phone/tablet holder with molded insert allowing for various-sized devices. Radar Red anodized vent rings, door accent rings, door trim spears and center console trim ring add color detail to the interior. The Rebel’s heated steering wheel is wrapped with semi-perforated black leather, accented with Radar Red X-stitches. Other features include the upper glove box door finished with a Rebel nameplate badge, deep all-weather rubber floor mats with contrasting Radar Red Ram’s head and the interior finished with a new black headliner and matching upper pillars. Rebel comes with an additional 1.0-inch of raised height for improved off-road approach, departure and breakover angles. Further, it is equipped with the exclusive Ram 4-Corner Air Suspension system allowing driver adjustment as needed for comfortable city driving with added lift to meet off-road challenges. For the city, a lowered ground clearance for easy entry is 6.7-inches with normal running height of 8.8-inches. To tackle the off-road, two Off-Road settings take the Rebel up to 10-inches or 10.8-inches as needed. At maximum off-road lift, the approach and departure angles are a robust 22.9-inches with a breakover angle of 23-degrees. We would note here that the choice of the 33-inch Toyo Open Country all terrain tires was spot on. Besides looking seriously ‘off-road’ we found they provided exceptional traction in off-road environs while delivering a smooth and quiet ride on the highway. The unique Rebel suspension is further supported by Bilstein monotube shock absorbers both front and rear and protected by skid plates for the suspension and the transfer case. Inside the cab, a fold flat load floor is standard along with under floor storage bins, under rear seat storage compartment and dual glove boxes provide flexible storage. Our ride and drive Ram 1500 Rebel 4×4 came in a monotone Granite Metallic Crystal Clear Coat with the signature Black and Red Ram Rebel interior and included the dual rear exhaust with chrome tips and Ram exclusive 4-Corner Air Suspension. It was optionally powered (3.6L V6 is standard) by the 5.7L V8 Hemi engine and mated to the 8HP70 8-speed automatic transmission. The 3.92 standard rear end was augmented with an Anti-Spin Differential for added off-road traction. 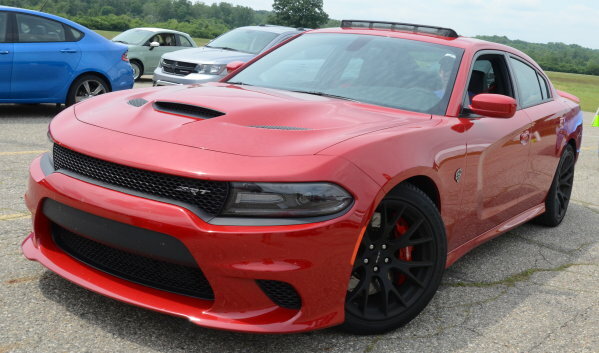 The MSRP for this basic Rebel with the 5.5L Hemi V8 and Anti-Spin Differential was $46,695. Protection Group with the Transfer Case Skid Plate and Front Suspension Skid Plate. Rear Camera and Park Assist Group with ParkView Rear Backup Camera and ParkSense Rear Park Assist System. Luxury Group with Auto-Dimming Power Heated Exterior Mirrors with Integrated Courtesy Lamps; Auto-Dimming Rear View Mirror with Hands-Free Microphone, Dual Sunvisors with Illuminated Vanity Mirrors and Overhead Console with Garage Door Opener. Upgraded UConnect 8.4AN with GPS Navigation added navigation plus SiriusXM Traffic and SirusXM TravelLink, Media Hub (SD, USB, Aux) and HD Radio. Other optional features included the Rambox Cargo Management System with exterior cargo bed storage boxes, Trailer Brake Controller – yes Rebel tows up to 6,800 pounds, Spray-in Bedliner and signature Ram Rebel Instrument Cluster with 7-inch TFT dispay. The delivered price for our test 2016 Ram 1500 Rebel Crew Cab 4×4 was $52,375. Other options we would likely have added were the Lockable Tonneau Cover with Embossed Rams Head along with upgrading the audio to the Alpine 9-Speaker with Subwoofer system. Any way you build it, your Ram 1500 Rebel Crew Cab 4×4 will be a rugged off-roader with plenty of on-road civility too. Along the way you run the modern gamut of driver-assistance aids. Lane departure warnings – which give little torque nudges on the wheel if you drift – and adaptive cruise control are part of the $1,695 SafetyTec 2 package, as is the forward collision warning system.